Once autumn’s chill is in the air, we don’t think twice about swapping our tank tops for sweaters and stocking our pantry with pumpkin-spice everything. So why wouldn’t we prepare our houses for the chill, too? Yes, that first freeze can often take us by surprise, leading to major headaches and thousands of dollars in repairs. So before you start stuffing your bookshelves with decorative gourds and planning the best Thanksgiving dinner your in-laws will ever eat, take a swing through these simple fall maintenance tasks. We promise a little prep work now will help keep your home running smoothly all season long. The term “winterization” is a bit of a misnomer: Yes, you’re prepping your home for winter, but the hard work needs to happen in autumn. And that’s especially true when it comes to your pipes. DIY: “Shut off all faucets and valves, and drain any outdoor piping, like sprinkler systems, before the temperature drops,” says Jane Li, a senior project manager at Mercury Insurance. To be extra careful, Li recommends putting away any outdoor hoses and wrapping socks around outdoor faucets. Call in the pros: If your winterization efforts uncover a leaky pipe, hire a plumber to fix the mess before the temperature drops. On average, a plumber will cost $300, but a broken pipe could run you upward of $5,000, depending on how much water damage there is. In other words, consider this money well spent. Just as you’ll spend more time indoors when the weather cools, rodents and pests will seek out a warm place, too—like your home. “Mice especially are flexible little creatures and can get through holes that aren’t much bigger than a dime,” says Karen Thompson, an editor at InsectCop.net, which researches and evaluates pest-control products and methods. DIY: Take a tour of your property, seeking out any cracks that might let a critter sneak inside. Seal any openings with spray foam or steel wool. “As a bonus, doing this will let you not only avoid rodents, but also ants and fleas,” Thompson says. Call in the pros: If there’s evidence these pesky little guys have already infiltrated your space, consider bringing in a pro. An exterminator will charge between $90 and $250 for an initial consultation, and costs will scale from there depending on what you need. Whether you’re getting up there in years or frequently hosting elderly parents, use the fall season to prevent, um, falls. “Falls make up almost one-third of all nonfatal injuries in America, and a little prevention can go a long way toward keeping you safe,” says Jason Biddle, who runs The Helping Home, a resource for aging in place. Floors: Scan your floors for fall risks. Look for clutter, slippery stairs, and loose rugs. Add sticky padding to prevent slips. Activities: What does your daily routine look like? You might need grab bars in the shower, or a second handrail by the stairs. Lighting: Is your home bright enough to see any potential hazards? “A well-lit home can help [you] avoid tripping on dining table legs, floor planters, and out-of-sight power cords,” Biddle says. Leaving: Examine your porch and outdoor paths. Are there any broken steps or overgrown shrubs that might trip you up when leaving your home? Call in the pros: Your home might require a major aging-in-place adjustment, like installing a lift or wheelchair ramp. Costs for a motorized stairway lift start at $3,000, and a wheelchair ramp could run $1,500. Unless you live in the desert or the deep South, you probably don’t run your air conditioner during autumn. But you might be letting your system waste away if you leave it sitting out in the elements all fall and winter long, which can damage the fan and coils. DIY: “Window units should be removed, covered, and placed in an area like the garage for safekeeping until they’re needed again,” says Richard Ciresi, who runs Aire Serv in Louisville, KY. Outdoor AC units should be properly covered. Call in the pros: If you’ve noticed your HVAC system running sluggishly all summer, now’s a great time for an inspection, which will probably cost a little more than $300. DIY: Before getting your fireplace inspected, make sure you’re not putting any living things in danger. Call in the pros: Most chimney sweeps can help break up a nest, too. Besides, you’ll be needing their help for another fall must-do: sweeping the chimney. A professional inspection and sweep will cost between $100 and $250. Nasty pests like carpenter ants or termites love hiding out in your firewood. Don’t let them hitch a ride inside. 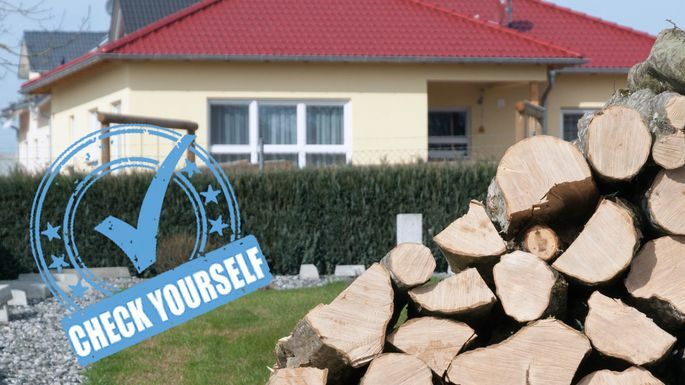 DIY: If you’re building a firewood pile this autumn, make sure to keep those logs at least 20 feet from your home. “This ensures that even if the wood has pests, they are less likely to transfer from the wood to your home,” Thompson says. Firewood should also be elevated during storage, which makes it even more difficult for bugs to sneak inside the wood. Call in the pros: If you spot termites in your firewood pile, call in the pros before hauling a single log inside. Treating a local infestation might set you back $150. Your ceiling fans are designed to cool you off during the summer—but they also serve a need during the chilly seasons. Every ceiling fan has a switch hidden on its base. When the mercury level drops, flip that switch so the fan is moving clockwise. Call in the pros: Pay attention to your home’s temperature on chilly days. Are you still cold? Consider an energy audit, which will cost about $400—but may help you save tremendously on your energy bills over the next few years.